Yes, this company is called "Hi I'm Skinny". And they make healthy snacks, aka, munchies made with whole grains, 40% less fat than regular chips, and, uh, "no nasty's". The products are all snack sticks, thin things that look sorta like fries. They make two flavors of quinoa sticks (sweet onion or sea salt), two flavors of "Superfood" sticks (mean & green or sweet potato), and one type of protein sticks (mesquite bbq). I honestly don't recall where I found these, as I certainly didn't seek them out, so I only got to try one item. They were too healthy for me. Guess I like "nasty's"? "Hi, I’m Skinny! I'm the all new Quinoa based snack stick packed with REAL Chia Seeds that makes me PERFECT for guilt free snacking!! I’m loaded with all kinds of whole grains and seeds of all kinds and have just the right amount of seasoning! I’m "phat" on flavor, but I won’t make the scales or your skinny jeans a scary thought!!" 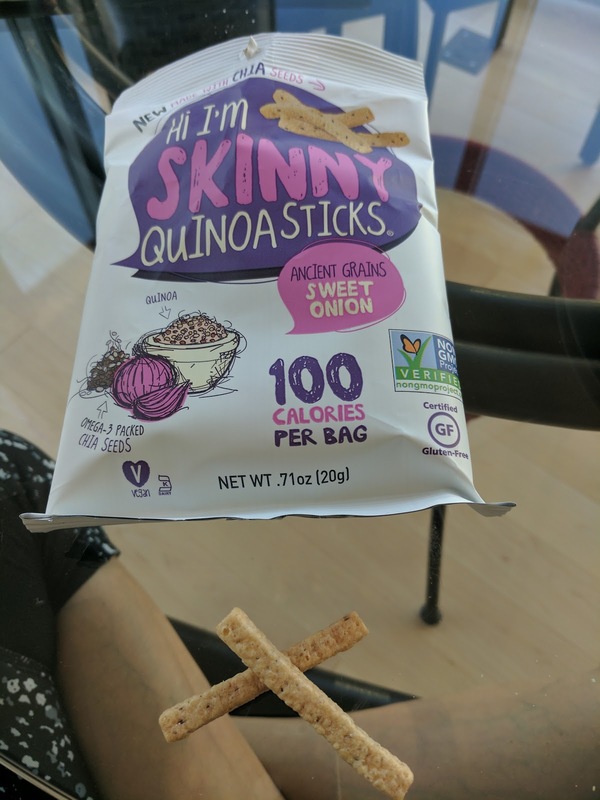 I opened my bag of quinoa sticks with some hesitation. I had plenty of dips standing by to dunk them into, assuming I wouldn't really want to just eat these things. From a distance, they sorta liked like fries, thin, and crispy, yet airy. However, they certainly didn't taste like fries. They tasted like Sun Chips, aka, like a healthy blend of whole grains. Which, I guess is what they were. They are made with quinoa flour, as expected, plus corn meal, white rice flour, brown rice flour, and chia seeds, and then sugar, salt, garlic, and onion for seasoning. The flavor was ok, although I didn't really taste "sweet onion". But really, just far too healthy of an item for me. 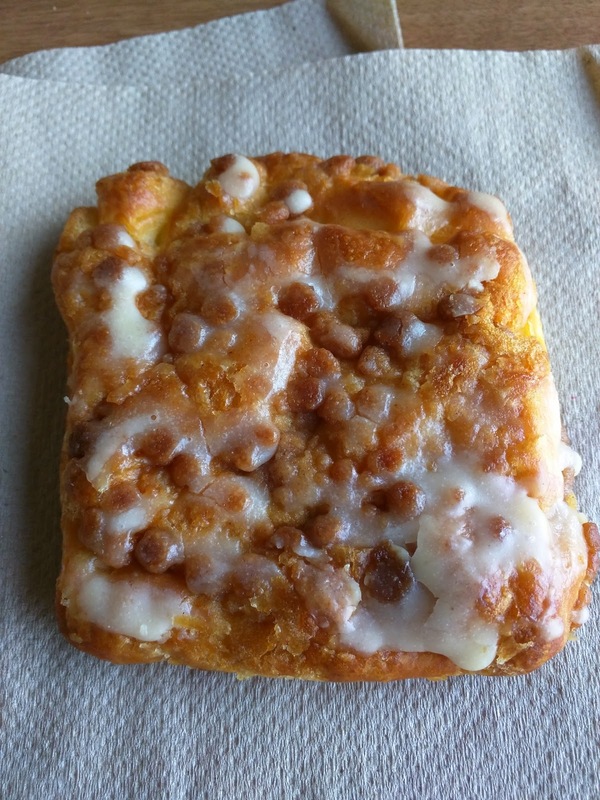 You know how I said I'd never try another Svenhard's pastry again, after my previous review? Sometimes I fail at taking my own advice. Particularly when there is a free pastry involved. Sometimes that isn't the worst thing. The context: Walk to work day. One of the walk to work stations was giving out free coffee (why I stopped) and ... Svenhard's pastries! 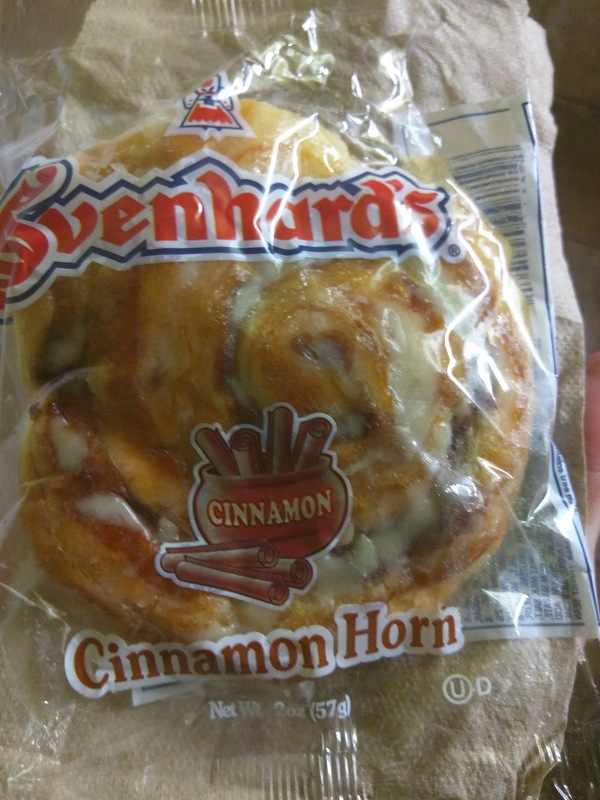 They had a large assortment, including a cheese horn that I almost went for, but, somehow, at last minute, I decided to grab a cinnamon horn. And ... I liked it. Sigh. Guess now I'll have to try more? Update (July 2017): I did try more. And they were just as bad as I remembered. Ok, no more of these, really. "Cinnamon folded in sweet dough, & glazed with our delectable icing delivers old-fashioned goodness, reminiscent of Grandma’s house." This looked just as bad as the breakfast claw. 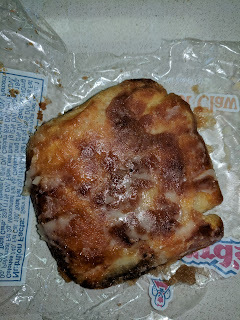 It was kinda smushed, the icing was all over the inside of the packaging, and, well, it looked like a packaged baked good. But I tried it anyway. I took a tentative first bite. It was soft, it was fluffy, it was sweet. No, the dough was nothing like a fresh pastry, but it had a really lovely sweetness to it. I took a second bite. There was plenty of cinnamon within the folds. The glaze on top, while not evenly distributed and rubbing off all over the place, was pleasantly sweet and went nicely with the cinnamon. I took a third bite. I stopped for a sip of coffee. And then I went right for the center piece, always the best part of a cinnamon roll. I had another, again, a freebie given out at an event. 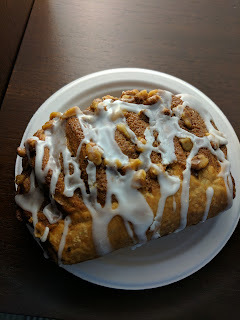 While I still enjoyed the icing on top (it really was tasty), and even the cinnamon between the layers, the pastry itself was just so lackluster that it made the whole thing not very enjoyable. I need to stop trying these. Svenhard's is a "Swedish Bakery" located in nearby Oakland. However, they aren't a traditional bakery, as they make packaged baked goods and do not have a storefront. I've seen their items at Target, Costco, and even on Amazon.com, so I think they run quite a large production. I wouldn't normally be that interested in packaged baked goods like this, but they have been around since 1893. Clearly, they have staying power, so perhaps their products really are tasty? 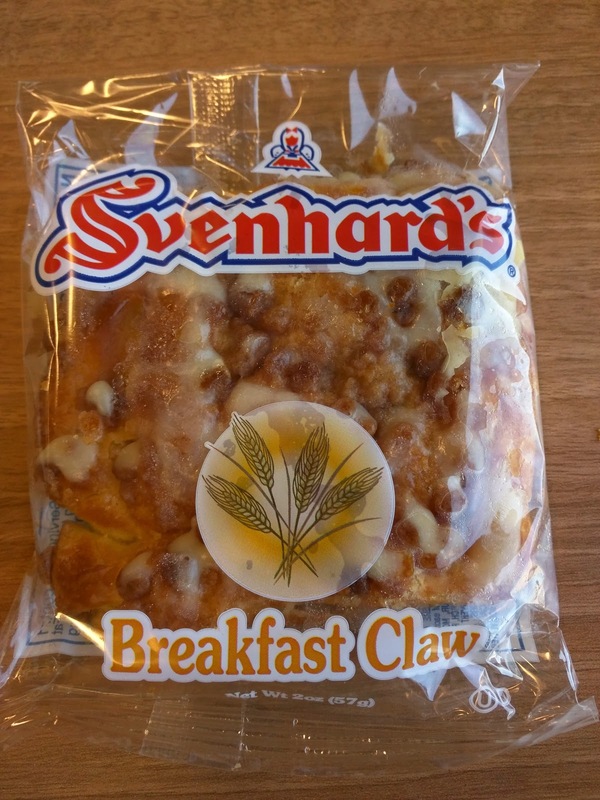 Svenhard's makes "claws", "curls", and "horns", all different varieties of croissant-like products with fillings. The "claws" are basically bear claws. "Curls" are just pastries in curled form, aka, cinnamon rolls and raisin snails. And the "horns" are danishes with different fillings. I've only tried one item, but, well, it was a packaged baked good. I had no desire to try another. "Served warm, or eaten fresh from the package, Breakfast Claws will melt in your mouth, and bring delight to your taste buds! Our special icing and secret filling formula garnishes every bite." I went for the fascinating sounding "breakfast claw", since, well, I was having it alongside a coffee for breakfast and it sounded like the most decadent of all the choices. Well, first I tried it "fresh from the package". "Fresh" was rather questionable. It was a bit scary looking. The pastry was about as bad as you'd expect. Sorta spongy and gummy. Not flaky. Not buttery. Greasy. The oil slick left on the napkin I set it down on for literally 20 seconds to take a photo was impressive. On the plus side, the icing on top was sweet and rather tasty. The little brown crumbles looked promising, but didn't deliver much flavor. Inside was a cinnamon sugar filling that was tasty enough, but, as you can see from the cross section, it wasn't exactly generously filled. Next, I tried warming it up, which did make it marginally better, but it was nothing like the magical transformation of the 7-Eleven cinnamon roll, and I still would certainly never get another of these. I had another of these given to me at an event. It was rather mushed, but, I still tried it. I again thought the topping wasn't too bad, icing and cinnamon crumble. The cinnamon filling was also ok. But the pastry? Just, ugh. Spongy, oily, just not good at all. 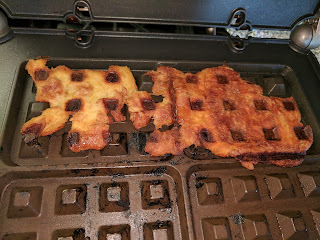 I scraped out the cinnamon filling since I liked that, and then got bored and decided to throw the rest (now in two halves), into my waffle iron, since, waffling leftovers often transforms them. This did not transform. 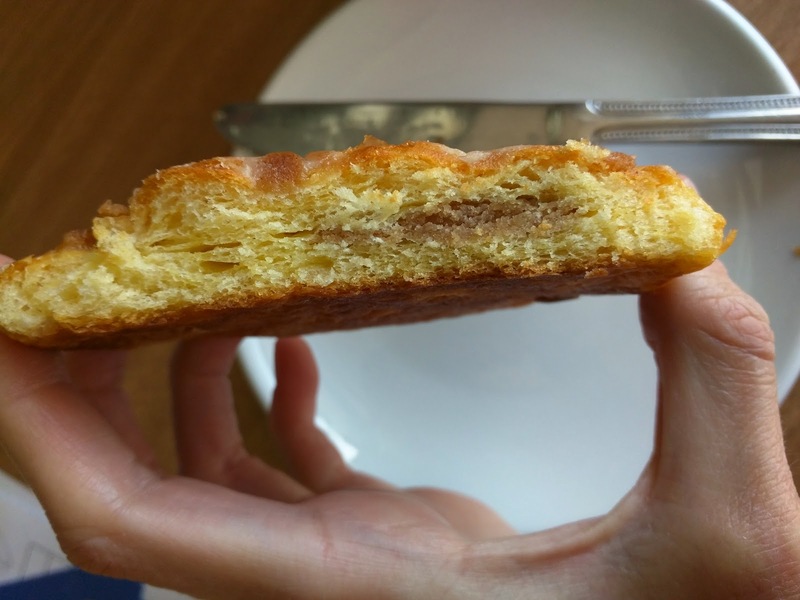 Yes, the texture improved and it got crispy, but the flavor of the horrible pastry was just impossible to get away from. Last time I reviewed Noah's, I concluded: "Noah's is nothing to write home about." I had zero intention of going back. But, my apartment complex hosted a brunch and they picked Noah's for the treats. The spread was mostly bagels (no toaster) with plain cream cheese (it *is* whipped so was nice and fluffy), plus a couple muffins and decadent looking danishes. Since the untoasted bagels with plain cream cheese were totally unappealing, I obviously went for the baked goods. They were not good. There was only one of these left when I arrived, and I went immediately for it. I should have taken it as a sign that others in the room had mostly untouched strudels sitting on their plates. I did hear one guy say, "I can't eat this, it is too sweet.". I'm certainly not one to shy away from sweets, so, that didn't concern me. The sweetness wasn't really the problem with it. Yes, it was absolutely covered in white icing that was sweet. But the pastry itself was the problem. It was danish dough, but, it wasn't flaky, it wasn't buttery, and it certainly didn't taste fresh. 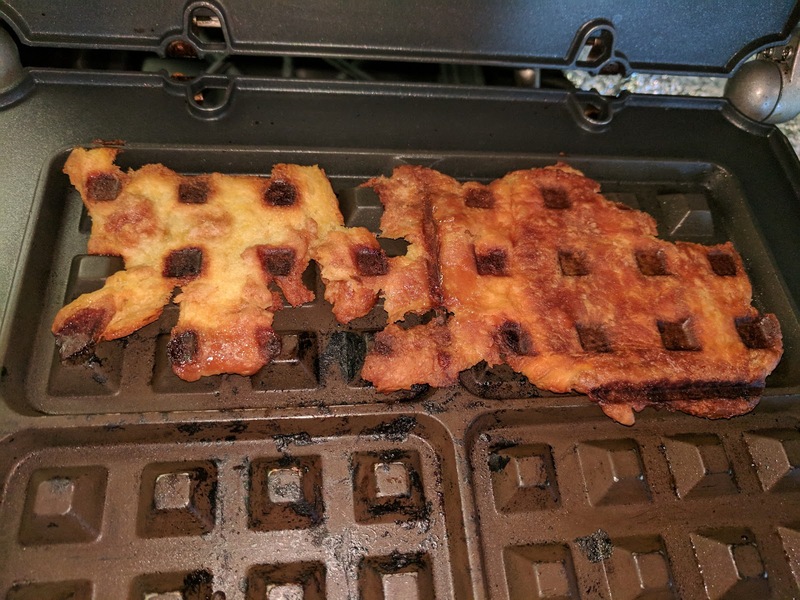 The top was way too crispy, over cooked but not burnt necessarily. Just hard, dried out, and a bit stale tasting. Also on top was the dark brown coating you can see underneath the icing and nuts above, which I think was cinnamon mixed with ... something. It was super hard too. The bits of walnut at least added a nice crunch? 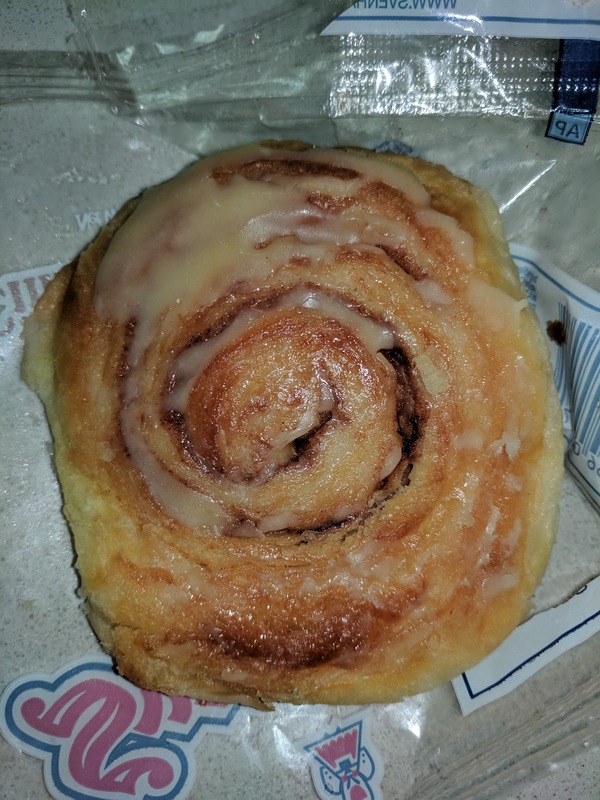 The only redeeming quality was the sweet cinnamon inside the folds of the danish. Sweet, good cinnamon flavor. But, with so many other elements not good, that wasn't enough to go on. Maybe it would be better warm? 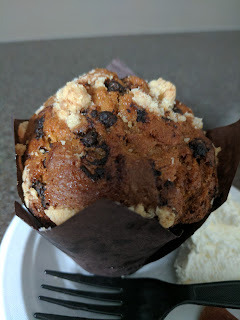 Not satisfied, I went for the last muffin: chocolate chip. It was perhaps worse than the danish. It looked ok, loaded with little chocolate chips, and topped with a bit of streusel. But ... it took was overcooked and stale. And it tasted like ... cake. Not a muffin, just like a cake, but sans frosting. And the streusel? As plain as the muffin itself. 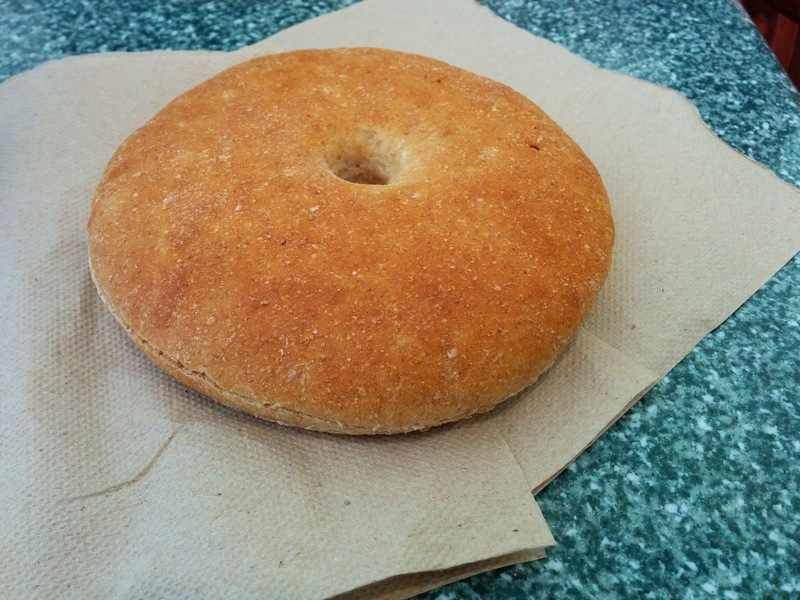 Last week, I reviewed the regular bagels from Noah's Bagels. I wasn't impressed. In fact, the only product I've ever liked from Noah's is the Asiago Garlic Bagel Clusters, fully of cheesy, garlicky, deliciousness. But, it was time to try out another new product, and how do I say no to that? This time, Thintastic Bagels. Thintastic bagels are only available in the basic flavors of plain, whole wheat, or everything. They are essentially a regular bagel, but, uh, thinner, designed for the calorie or carb conscious diner. A plain Thintastic bagel weights in at only 140 calories, compared to a regular plain bagel's 250. If you like Noah's regular bagels, perhaps these will appeal to you, but for me, they were exactly the same as the regular bagels, far too bready, not "real bagels. Yes, it was shaped like a bagel. It was called a bagel. It looked like a bagel, albeit one that had been quite smushed. But it tasted like wheat bread. It had no crust to it, clearly not boiled. Just, dense bread. It was fine bread, but, bread. Not a bagel. It also just didn't look very appealing. I know that it supposed to be thinner, but it just looked squashed. If you like bready bagels, and are watching out for carbs, perhaps this is for you, but it was certainly not for me. I also got some cream cheese, er, schmear, to pair with my bagel. 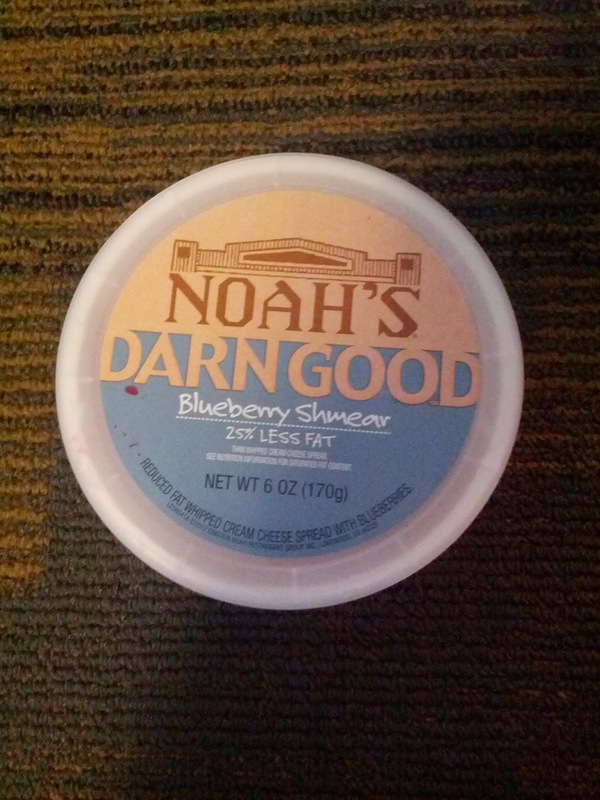 Noah's has schmear in a slew of flavors, all of which sound awesome. It is always so hard to pick one. I decided on the honey almond, as I thought it would compliment the whole wheat well. It was pretty standard cream cheese, nicely fluffy, slightly sweet, with little bits of crunchy almonds inside. Not bad, but, you aren't going to Noah's for the schmear, are you? I received an offer to come trial a new product at Noah's Bagels (or, if you are in some parts of the country, Einstein's). They called them "Bagel Clusters", described as bite-sized pieces of bagel dough, with toppings added, then baked. They claimed to be "served piping hot, for you to pull apart and enjoy". They were trying out one sweet version, cinnamon sugar, and one savory, asiago garlic. I do sometimes really enjoy bagels, and hot baked goods, so I eagerly signed up to redeem my freebie. I selected a Noah's location near me, and was assigned a day and time to come try them. 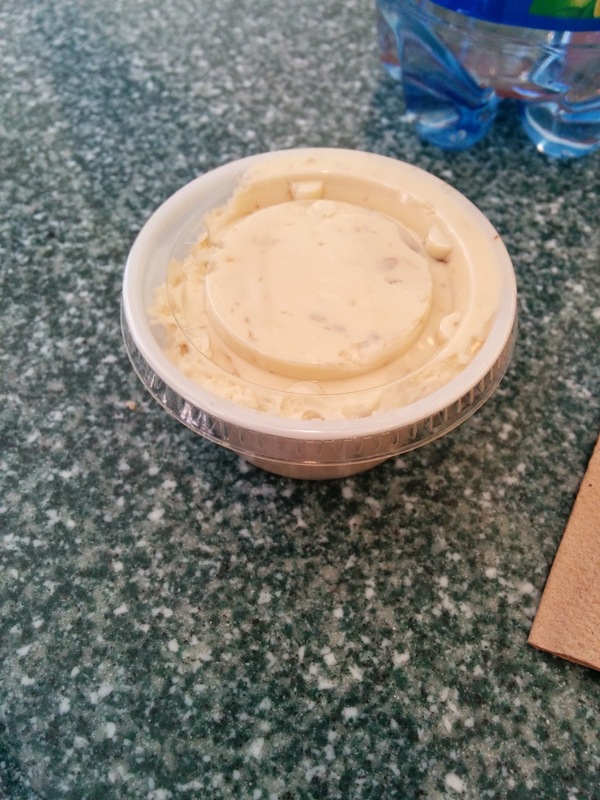 When I arrived at the location, the guy pointed me at the Bagel Poppers, little bite sized chunks of bagel, served cold, in a container. They have had those in the stores for a while now. I said, "uh, no, not the bagel poppers, the bagel clusters", and I showed him my certificate. 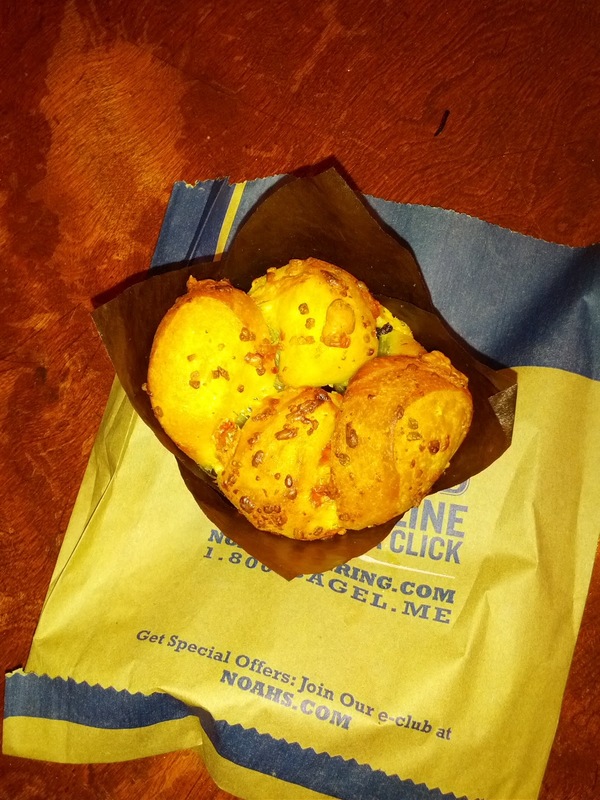 He said that they did not have bagel clusters, and that he was instructed to just offer people bagel poppers instead. I didn't want cold little bagel nuggets, I wanted a hot, fresh, almost-muffin-bagel! Grumble! I tried to sign up for another location, but since I'd already signed up, I wasn't able to. And you can't buy them yet in the shops. So I had to enlist some friends to sign up and let me tag along to try out the real things. I was impressed that Noah's kept good control of the trial experience, allowing only single sign ups, limiting the time slots, and requiring ID to actually receive the product. But uh, I actually WANTED to receive the product, not the alternate! They clearly have some kinks to work out before these go live everywhere, but one of them was really delicious, so I hope they decide to offer them. Cinnamon Sugar Bagel Poppers. $1.99. 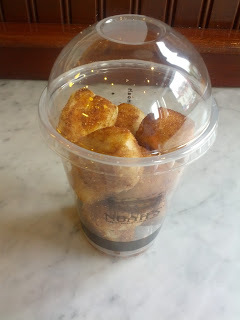 So, on my first visit, I got the cinnamon sugar bagel poppers instead. They were basically bite sized bagel chunks, served in a togo container. Served at room temperature, and already pre-packaged. They tasted incredibly stale and dried out. Yet at the same time, they were gummy, as condensation had formed inside the sealed container. Dried out and strangely gummy? Gross. Very gross. Would never get again. Cinnamon Sugar Bagel Cluster. $2.99. On the next visit, to a different location, I entered to see the bagel clusters displayed in the case along with all their other goods. Seemed like this location was already selling them? They looked exactly as I expected: basically, little bite size chunks of bagel dough, mushed together and baked kinda like a muffin. I asked the staff member which one she recommended, and she said she hadn't tried either. Dear Noah's, let you staff try them so they can help guide your customers! Being a fan of sweets, I went for the cinnamon sugar version. I was a little surprised when she just reached in and handed it over. I mentioned that the e-mail I received said they'd be served "piping hot". She looked at me quizzically and was like, "uh, no. And we aren't supposed to put other things into the toasters." Hmm. Perhaps some kinks to work out here. Anyway, I eagerly dove in. It looked pretty good, like a hybrid cinnamon roll / cobblestone muffin / monkey bread. 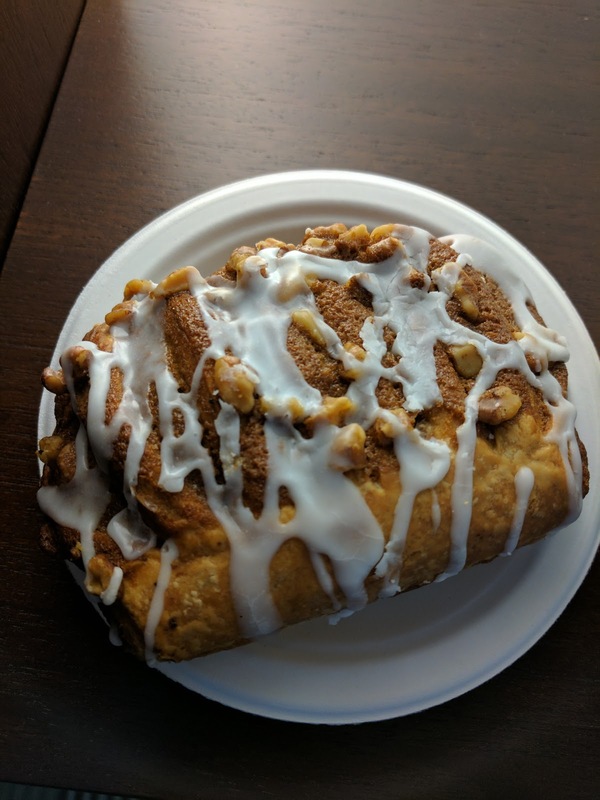 Unfortunately, it went the way of the cobblestone sweet bread from Panera: all looks, and never quite what you wanted it to be. Like the bagel poppers, it was dry and stale. There was cinnamon-sugar coating all over the chunks, along with some streusel on top and along the sides. It had potential. It was fun to pull the pieces apart, far more interesting to eat than a regular bagel or muffin. But, the good part of bagels is when they get toasty and warm, and then you have plentiful toppings on them. This didn't have warmth, or crust, or toppings. It was just cold, stale, chunks of bagel. There were several ways this could have worked for me. If it had been drizzled with some kind of icing, and just turned into more of a dessert offering, that might have worked better, more like the Panera one. Or, if it had something to dip the chunks into as I tore them off, that actually would have been fun. Or perhaps, just if it had been served hot and fresh, like a warm muffin. But as is, it was a failure. It was huge however, hard to see in the picture, but far more bagel pieces than a standard bagel, far bigger than even an American-sized muffin these days. The regular $2.99 price tag seemed appropriate, but I'd never get another one of these in this form. Asiago Garlic Bagel Cluster. $2.99. On the last day of the trial, another friend had an invite, so we headed to yet another location. As we walked in, certificate in hand, the guy at the register identified us immediately, before we even approached, saying "bagel clusters!!" We looked up in surprise, and said yes. He asked which kind, and given my horrible review of the cinnamon-sugar, my friend went for the asiago garlic. Not something I'd normally order, but it was her choice, and I was just there to steal a bite. To my surprise, the worker beamed. "Great choice!" he exclaimed. "It is really delicious!". His excitement was very different from my previous visits, as was the fact that he'd actually tried the product. I was still very skeptical, given how horrible the other one was. He dashed off into the back. The bagel clusters were not out on display, and were hidden away somewhere. The first thing I noticed when he handed it over was how much smaller it was than the cinnamon-sugar. Since they were from different locations, I'm not sure if they intend for one to be smaller, or if it was just a difference in the baker, since they are just starting making them. Regardless, it was still plenty large for two of us to split. As I pulled it out of the bag, the next thing I noticed was how slick my hands got. They were glistening, just from touching the wrapper! Uh-oh. The next thing I noticed was that it was actually slightly warm. Not "piping hot" as promised, but not room temperature. I forget what I noticed next, as I was immediately distracted by how delicious it was. It was cheesy. It was garlicky. It had a nice chew to it. A strange thing to have for breakfast, as I don't tend to have cheese or garlic for breakfast, but it was tasty. It reminded me of garlic knots from a pizza place back in my hometown. Probably more appropriate for an afternoon snack, unless you are into garlic in the morning. Anyway. It was good. Not what I would have ever ordered on my own. Not what I was expecting. But it turns out that cheesy, garlicky, warm, bagel can be really good. I guess just like any good cheesy garlic bread at an Italian place. I know Noah's actually has a garlic bagel, and a bunch of different cheese bagels, so I might be tempted to try those out too, although I'm not sure how I'd top them. Cream cheese doesn't seem right, maybe just butter? I'm not really sure what has inspired it, but a while ago, I went on a bagel kick. The thing is, I don't really like plain bagels, or even what I'd call "basic" bagels - sesame, poppy, everything ... they just really don't do it for me. I want bagels that are more like muffins, loaded up with goodness. Or I want to have all sorts of flavored cream cheese to put on top. Most cafes carry only standard bagel flavors, with plain cream cheese, which are so boring! Noah's Bagels is obviously not a cafe, and of course offer something like 25 types of bagels, starting with Classics like you can find in just about any cafe (everything, plain, whole wheat, pumpernickel), to the "Signature" bagels, which are still pretty commonplace varieties, ranging from the savory (sesame, salt, garlic, egg, potato, 9 grain, sourdough, onion, asiago, etc) to sweet varieties (blueberry, cinnamon raisin, cinnamon sugar, chocolate chip, etc). For the truly interesting ones, they have "Gourmet Topped Bagels", like the dutch apple crunch, power protein, or a slew of cheesy offerings. 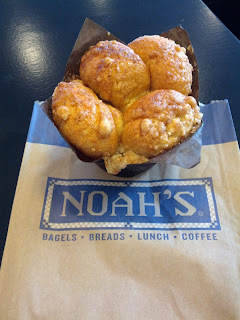 A few months ago, I went to a new product sampling for Noah's, for their new bagel clusters. I tried both the sweet and savory versions, and was pleasantly surprised by the asiago garlic ones. I'd never had cheesy bagels before, but the cheesy bagel clusters inspired me to try their slew of the regular cheese bagel options. 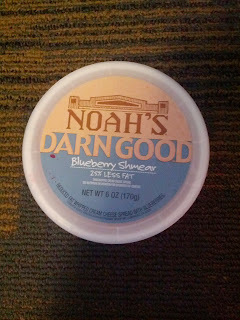 I've also tried a few other bagels and spreads from Noah's over the years, so I've included those notes below too. Overall, Noah's is nothing to write home about. Their bagels remind me more of bread than what I consider a bagel. I realize that yes, bagels are a bread product, but particularly if you were to just eat one plain, they really are just bread. They don't have an interesting chew, nor a crust to speak of. They are moist and fluffy. I think they are not boiled like real bagels should be. You certainly wouldn't ever want to just eat one plain. If you toast it and add a generous slathering of their slew of flavored cream cheeses, or turn it into a bagel sandwich or pizza bagel, then perhaps they are worth eating. But as a bagel? Not winners. Tuscan Pesto Gourmet Topped Bagel. I started with the most extravagant of the cheesy bagels - Tuscan Pesto Gourmet Topped Bagel. You may be looking at the photo and saying, "uh, bagel? Where is the hole?" I guess the "gourmet topped bagels" are regular bagels, but with so many toppings baked in that they cover the hole. I'm not sure what a tuscan pesto bagel really is made of. Their website has absolutely no information. 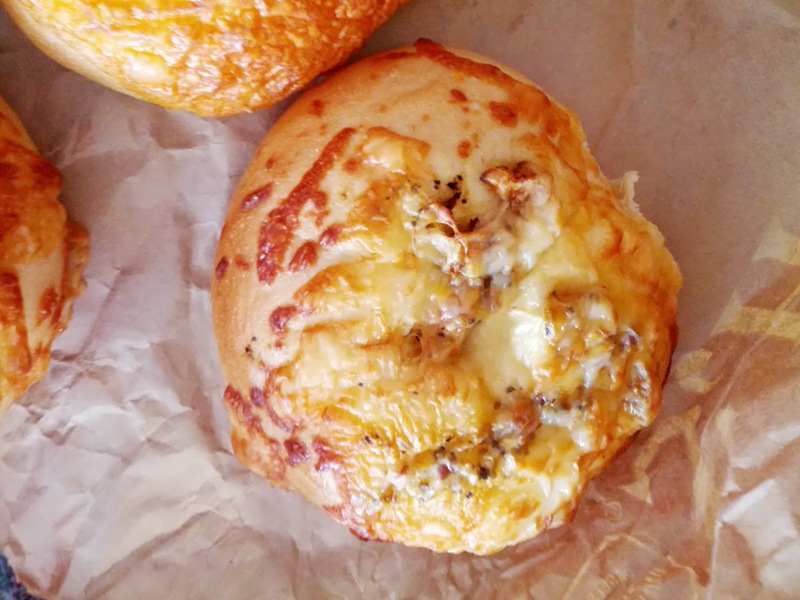 It seemed to be a plain bagel, topped with some form of cheese, some pesto, and it seemed like onions? I also wasn't entirely sure what to do with it. They say that the gourmet topped bagels are designed to stand alone, or be served with cream cheese. Putting cream cheese on this seemed really strange. I sliced mine in half and toasted it. The top half, with all the pesto and cheese, was decent enough. Basically warm, pesto-y, cheesy bread. It certainly didn't benefit in any way from being a bagel, nor were the pesto or cheese particularly good, but it was what it was. Not a breakfast item, and not really a meal, perhaps a side with some pasta? But again, why a bagel? The bottom was pretty much devoid of anything worthwhile though. 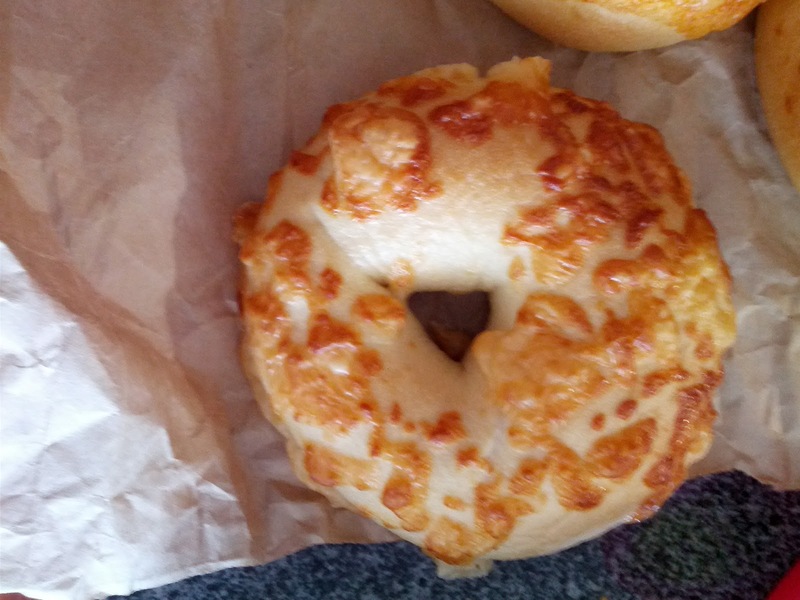 It was just a plain bagel, slightly more oily than normal from oils that ran off the cheese when they baked it. Recall that I find no purpose in life for plain bagels, particularly not for oily ones that are basically just bread. I turned it into a pizza bagel with sauce, and it was ok, but I was just trying to salvage it at that point. Maybe I just don't get it, but I don't see why I'd ever want this. If I wanted a good bagel, this is not it. And if I wanted good cheesy pesto bread, this was also not it. A mediocre cross of all of the above. Meh. Cheddar Jalapeño Gourmet Topped Bagel. 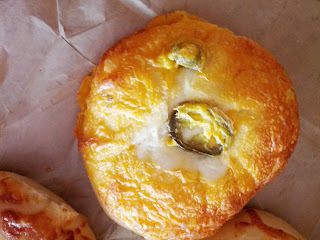 Next I moved on to another of the gourmet topped bagels, the Cheddar Jalapeño Gourmet Topped Bagel. Like the tuscan pesto, it was a plain bagel, coated in cheese and toppings, with the hole filled in. This one was worse than the tuscan pesto. That one at least had something interesting going on from the pesto and herbs, but this was just a plain bagel, covered in poor quality cheddar, with a few slices of probably canned jalapeño. Yes, the jalapeño had a little heat, but it wasn't interesting enough to stand alone. Perhaps it would work with some sundried tomato cream cheese? I wasn't sure what to do with it. Again, why was it a bagel? Maybe it would have worked well with egg in it as a breakfast sandwich, with the cheese on the bagel instead of inside? Since I saw it as basically just cheesy jalapeño bread, I cut it into chunks, warmed it up, and served it alongside some chili. It worked fine as a cheesy bread to dunk into my chili, but again, why a bagel? I wouldn't get again. And finally, the most basic of the cheese bagels, this one from the Signature bagel line. A standard bagel, (this time with a hole! ), and some asiago baked on top. The asiago actually had a decent flavor, far more flavorful than the other cheese bagels I tried. But again, I wasn't sure what to do with it. Sundried tomato cream cheese? Turn it into a pizza bagel? I dunno. I wouldn't get again. Blueberry Bagel: Loaded up with blueberries, but just not much flavor. Decent chew. Nothing great, and wouldn't get again. Pumpkin Bagel: Very … pumpkiny. But same boring, bread-like, texture. I liked that it was whipped and fluffy, but it did not have much flavor to it. Blueberry cream cheese, er, shmear, should taste like blueberries! Meh.